Why choose Nuffield Health Wessex Hospital for my liposuction? The Nuffield Health Wessex Hospital has been providing exceptional private healthcare to people in Hampshire for over 30 years. Liposuction can have a long recovery time and at our Wessex Hospital we offer a complete treatment package that includes any aftercare you need. We offer comfortable private bedrooms with en-suite, tv and wi-fi. Our free car park has space for visitors and they are welcome to come and see you at any time. 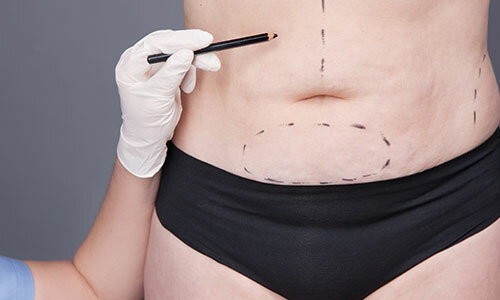 Considering liposuction? Why not attend one of our free open events. You'll get to meet one of our consultants and find out if this fat removal procedure is right for you. Your consultant will assess your overall health, skin quality and the amount of fat to be removed before talking you through what approach will be used. Various types of anaesthesia are used during liposuction. If only small areas of fat are to be removed you may have local anaesthetic. More extensive surgery may require general anaesthetic. The length of your liposuction procedure will depend on the amount of fat being removed. Your surgeon will make a small incision in the skin. Using a thin, hollow tube they will break up the fat cells beneath the skin surface and remove them with a special suction or vacuum. Several incisions may be required for larger areas. Any incisions will be stitched at the end of the procedure. The area will be bandaged for support. Depending on the extent of your surgery, you may be able to have the procedure as a day case. You will need pain relief medication once the anaesthesia wears off. You may need to wear an elastic support garment for two to six weeks after surgery. Remember to ask a friend or relative to drive you home. You will need to have your stitches removed five to ten days following your surgery. You may need to take one to two weeks off work depending on the extent of your procedure. For the first few weeks you will need to rest and avoid any strenuous activity. Once the swelling has decreased you will notice a difference in your body contour. However it may take up to six months to the area to settle. Walking may be uncomfortable if your procedure was in the lower part of your body. Any stitches or staples are removed. You may need to continue to wear support garment. It can take 6 months for any swelling to disappear. Final result can be judged as long as your weight has remained stable. The results of liposuction appear gradually as swelling and bruising subside. The overall appearance will be visible within two to three weeks and most of the remaining swelling will have gone within six to 12 weeks. However, your shape will continue to improve over the next six months to a year, as long as your weight is stable. What are the complications of liposuction? Expert advice on the pros and cons of body contouring.